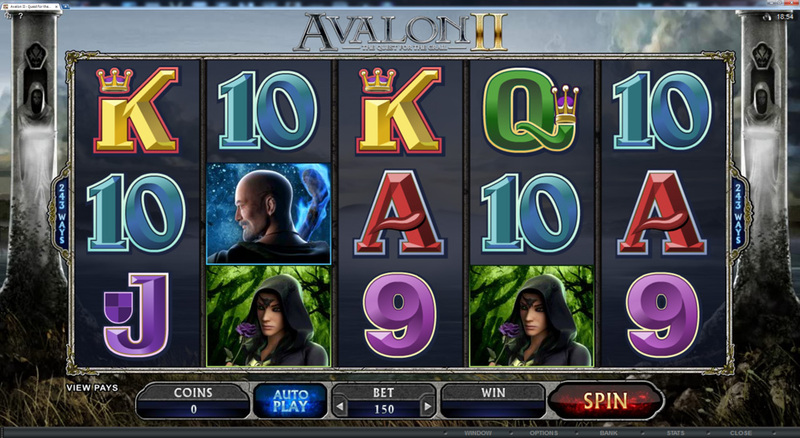 Avalon II is a new Microgaming online slot, released in February 2014. This new slot features 243 ways to win, stacked wilds, an expanding wild, and several different bonus features. The graphics are very nice and there is a good variety of bonus features. Quite an upgrade from the original Avalon slot, but that slot is over 10 years old now and I still enjoy playing it. The only thing similar between the two slots is the theme. The coin values range from 1c up to 50c, and you can play up to 5 coins per spin. Since it is a 243-way slot, the bet works like it would on a 30-line slot, so the minimum bet is 30c per spin and the max bet is $75 per spin. There is no progressive jackpot, but the top payout during the bonus feature is $1.2 million. There are two features available during regular spins, if the Lady of the Lake symbol lands on the middle reel, it will expand to make the entire reel wild. 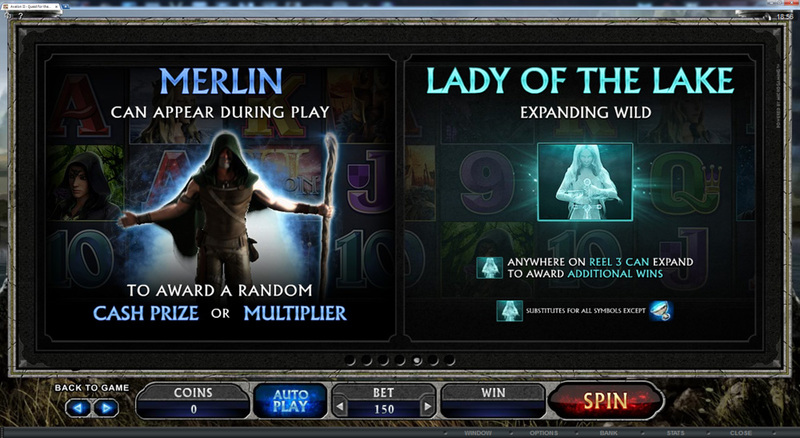 At the completion of any spin, Merlin can pop up randomly to give you a bonus. He will either multiply your win, or give you a cash prize. The grail symbol is the scatter, landing three or more of these during a spin will trigger the Grail Bonus. The Grail Bonus is your journey through the kingdom on a quest to retrieve the Grail and return it to Avalon. It consists of 8 different features, each bonus trigger takes you further along your quest. The first feature of the Grail Bonus is Lake of Legend where you try to reforge the sword Excalibur. You are given 10 dice rolls in an attempt to get all the numbers 1 through 6, as each number represents a fragment. 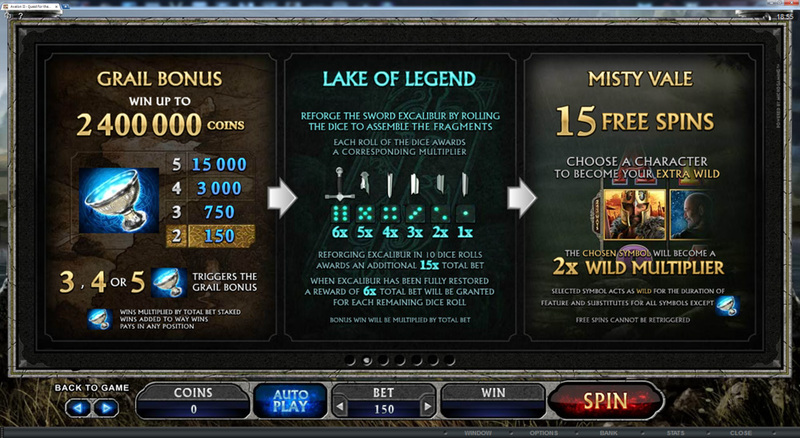 Each dice roll awards 1x to 6x your bet, and you get 15x for completing the sword. If you get all the fragments before the last roll, each roll afterwards will be worth 6x regardless of the result. 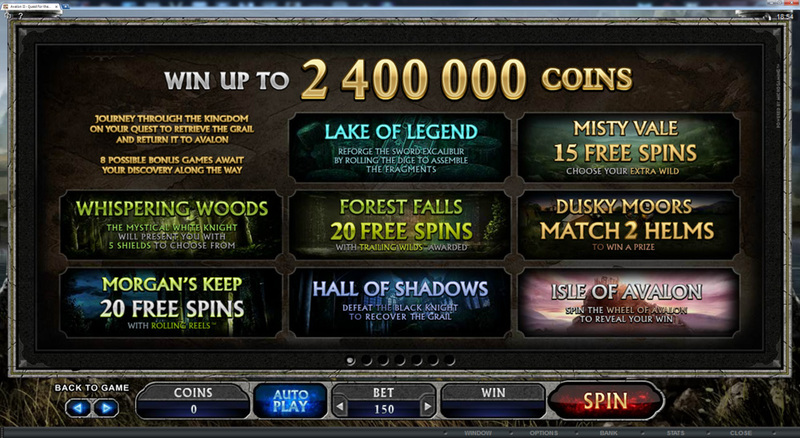 On the second bonus trigger, you go to Misty Vale with 15 free spins. You choose a character to become a 2x wild during those free spins. Play Avalon II now at 32Red Casino! On the third trigger, you must choose your path between two different features. Whispering Woods takes you to the Mystical White Knight who presents you with 5 shields to choose from. You can keep your first pick, or choose again, you have two chances to change your mind. Forest Falls gives you 20 free spins with trailing wilds, which stick to the reel and slide down one spot each spin, leaving a trail behind. 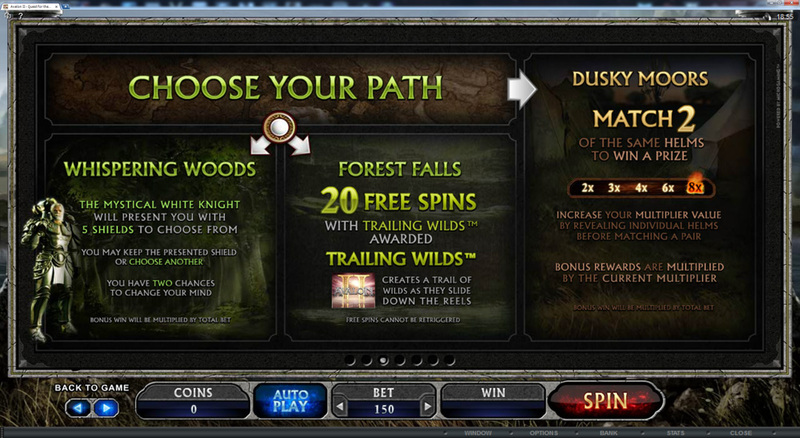 I think the best choice there would be Forest Falls, mainly because I prefer free spins over pick features. The fourth bonus trigger takes you to Dusky Moors where you are given a choice of helms and you need to match two; the multiplier increases for each non-matching helm found until a match is made. 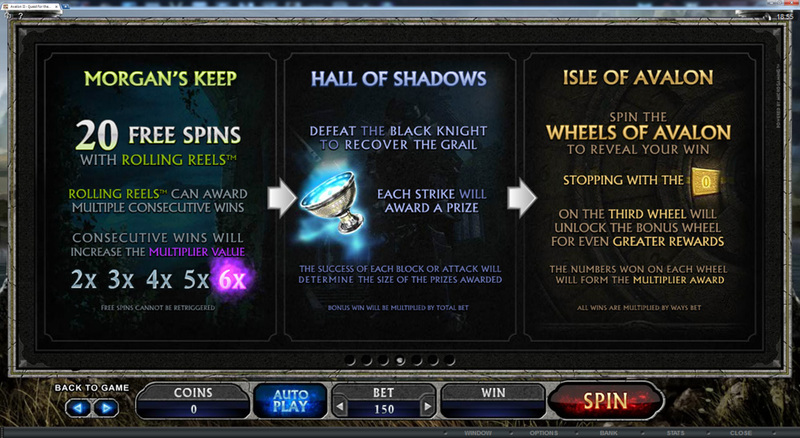 The fifth time the bonus is triggered, you are taken to Morgan’s Keep where you get 20 free spins with rolling reels. On each spin, all symbols involved in a win will be removed and more will fall in from the top for more possible wins, and this continues until nothing lines up. Each consecutive spin will increase the multiplier 1x up to 6x. The sixth bonus trigger takes you to the Hall of Shadows where you try to defeat the Black Knight to recover the Grail, each strike will earn you a prize. The next bonus trigger will see you return to the Isle of Avalon, where you spin the Wheels of Avalon to reveal your prize. If the third wheel stops on the golden spot, you will unlock the Bonus Wheel. I’m assuming that’s where the top payout of 2,400,000 coins comes in to play. I haven’t made it all the way through the Grail Bonus yet, but so far I’m really enjoying this slot. It’s very nice to look at and I like how you have to go through the various features on a “quest”, it keeps the game entertaining and gives you a goal, other than the obvious big wins you’re trying to get. You can find this new slot at any of these Microgaming Casinos, or use the link above to get 50 free spins.